← What the Legislature should do with a special session on drought. How Australia actually managed their drought. 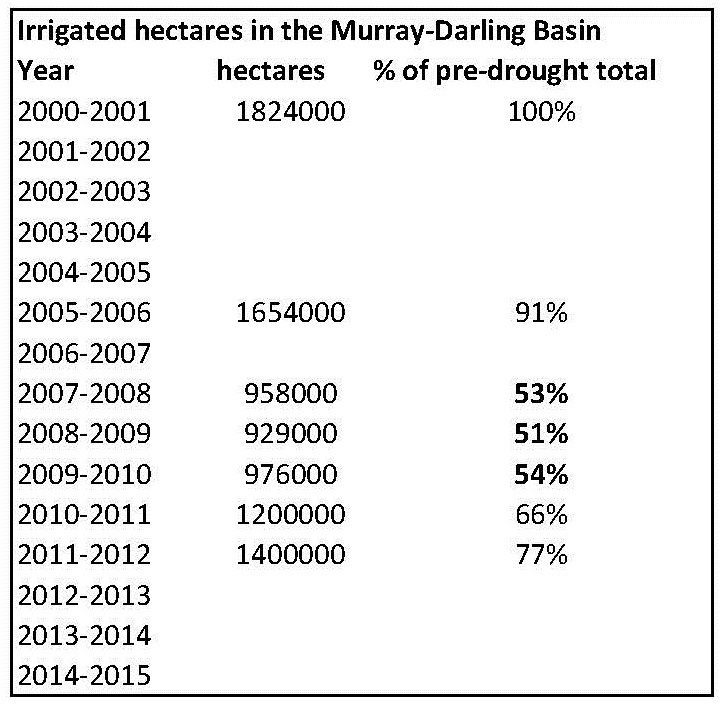 This PPIC post describes lessons from Australia’s drought management. But, like almost every article I see about Australian drought management, it is coy about what Australian management actually did. The Australians also depended heavily on water markets to reduce the costs of their mega-drought. The flexibility and autonomy offered by water trading helped communities allocate water quickly and efficiently to competing uses, and also provided an effective way to recover it for the environment. What they actually did to free up water was fallow half their agricultural acreage. In California, that would be about 4.6 million acres, rather more than the 800,000ish acres fallowed here this year. A quarter of Australian ag acreage has never returned. Abstract talk about water markets “allocat[ing] water quickly and efficiently” disguises the fact that actively managing this drought will force us to do much less. Water markets aren’t a magic ticket that allow us to do mostly the same things with much less water. The water went away, and no matter what process we use to manage the drought, we will do less of the things that depend on water. Markets usually do not make new water, they just reallocate some of it so that it has more economic productivity (and not necessarily ideal economic productivity). Indeed, having functioning markets will often reduce over-development of more expensive water sources. Alas, in dry places with a lot of variability in water supply, like California, where we want to support a large population and economy, large agricultural industry, and support native ecosystems, there will be no perfect solution. Careful use of markets only can help things along and provide more flexibility and adaptability. Sorry, no panaceas, even for homo economicus.